Do not trade a cow for these. Trader Joe’s is no stranger to whimsy, and what could be more whimsical then bringing a bag of magic beans to market? That’s precisely what Trader Joe’s has done with their mysterious new offering, Trader Joe’s Magic Beans! An extremely enigmatic offering that combines vagueness with and strange product impulses into a bewildering product. What it is: Milk chocolate over crunchy nougat. Price: $3.99 for a 7.7 oz bag. Worth it: No, not very good quality sweets. 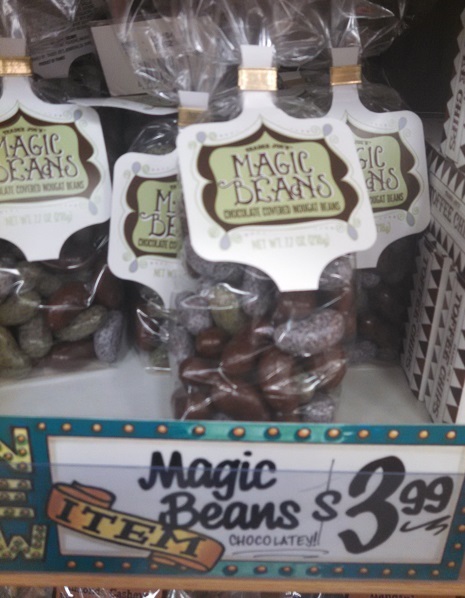 Trader Joe’s Magic Beans are certainly magical. Not necessarily in the way that wizards and dragons are magical, and not in the way that rainbows and a child’s smile are magical, but in that way a that mild concussion is magical – by turning ordinary things into an set of surreal and perplexing stimuli that don’t really make sense. Upon seeing a bag of Trader Joe’s Magic Beans for the first time, many questions immediately spring to mind. Magic beans, really? What makes them so magical? What are they exactly? Where do they come from? None of these questions are answered in the slightest anywhere on the bag. You are presented with a strange, plastic sack of oblong candy, a product name, and no more. One of Trader Joe’s more infuriating traits is a tendency to leave off the product copy. When they do include copy, it’s uniformly delightful and well considered – equal parts gently amusing and gently educational. However when they elect not to include copy, it’s almost always in instances like this – on their most unusual and unique items. TJ’s is giving us nothing to go on here. “Mystery Beans” might be a better name. All we’re told is that they’re chocolate covered nougat beans. The surprise is that not only is the chocolate shell hard and crunchy, but so is the nougat in side. Yes, crunchy nougat – not the typical soft and pliable stuff so pleasantly yielding to the tooth. This nougat has been hardened to a brittle condition. Biting into one of these over-sized beans is an act of crunch, crunch, crunching – like biting into some chocolate covered brittle or toffee. That’s the other unusual thing. The nougat is crispy hard and almost buttery sweet – not at all like ordinary nougat, much more like toffee or crunchy caramel. I’d never had crunchy nougat before. It’s certainly not something I ever though to ask for. Are there people out there who appreciate crunchy nougat? Is this a thing? I have to say it wasn’t entirely unpleasant, but going in expecting nougat made it a little off putting. The chocolate part can pass largely without remark. It’s your basic, low quality Halloween candy-style milk chocolate making up a quarter inch thick cocoon. Not the best Trader Joe’s has to offer by any means. Interestingly, these beans have also been shellaced – literally. Shellac is listed as the eighth or ninth ingredient. As you probably know, shellac is a resin generally encountered as a wood or nail polish varnish. Typically, that’s not something I’m looking for in my food – even though it is technically edible and a somewhat common food glaze. In the end, there’s nothing really for me to recommend these on. Unless you’re intrigued by the concept of crunchy nougat, it’s hard to imagine anyone picking up these mysterious shellaced beans, even if I highly recommended them. Apart from giving them to out to kids as part of a “magical” gift bag, these beans were just sort of blah. Would I Recommend Them: No, not particularly. Would I Buy Them Again: I have had a enough crunchy nougat and shellac, thank you. Final Synopsis: Low-quality chocolate around a nougat-esque core does not necessarily equal “magic”. The shellac thing is scary! I avoid it because it’s made from insects and I am vegetarian. I hope they don’t make other chocolates with this ingredient in the future. According to the ingredient list on their website, the shellac is made from coconut oil. What a waste of whimsy. I recently found your blog and spent way to much time reading the archives and laughing! I hope you might try some pumpkin items this season. I’m curious (and suspicious) about the pumpkin cinnamon rolls. Also, if you have a calorie deficient, I highly recommend the pumpkin cheesecake. We bought the pumpkin cheesecake for my husband’s birthday this week. It is yummy. I just saw an article online at HuffPo that they now have pumpkin cookie butter, so I may have to pick that up tomorrow. Thanks for the review! I saw these today at TJ’s and was wondering about them. I’ve had crunchy nougat before. They’re sold in the candy sections of Asian supermarkets. I prefer the chewy version so I’m glad I didn’t pick up these magic beans. thanks for the warning! shellac? Surely this is made from a surplus of Stuckey’s nougat that TJ’s acquired through one of their holding companies and the shellac from a “Make Your Own Record!” booth located at one of the many deep south (Memphis?!) Stuckey’s locations. i WAS SO MAD about these. seriously. i saw them. would have said no easily. the word nougat intrigued me. i was thinking nougat. chewy nougat. that is NOT nougat. its toffee. its basically chocolate toffee. with mostly chocolate and not even that great. i want my five bucks back. I actually quite liked these. Crunchy nougat is a different style, but it is a thing and I really like it. And however you feel about shellac, it’s always used in candies like this with a shiny, polished finish. I didn’t find the chocolate to be waxy like cheap Halloween candy at all. It seemed like their normal milk chocolate to me. They’re on my list to get again next time. I really enjoy these ~ but I’m a crunchy kinda girl!